North Carolina’s most accessible coastal destination ensures a positive experience for all visitors. 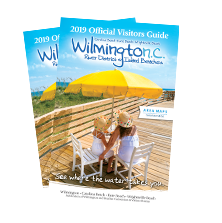 Wilmington, NC – The visitor center for Wilmington, NC, and its island beaches often receives inquiries from travelers with special needs who are delighted to discover that Wilmington, Carolina Beach, Kure Beach and Wrightsville Beach can accommodate visitors of all abilities. The Wilmington area offers a variety of outdoor recreational attractions and activities that make the destination accessible for all. Hugh MacRae Park, one of Wilmington’s most frequented parks, now offers an inclusive playground that features a Liberty Wheelchair Swing. This swing is specially designed for children who must be in a wheelchair and cannot sit on a regular swing, allowing them to enjoy a safe and fun experience at the playground. Keys to the Liberty Wheelchair Swing are provided free of charge at the New Hanover County Parks & Gardens office (910-798-7620) and the Wrightsville Beach Parks & Recreation office (910-256-7925) during regular business hours. Several other municipal parks in Wilmington offer accessible features as well. For a full list of county parks, visit the New Hanover County Parks & Gardens website. Olsen Park, home to baseball fields, softball fields and a volleyball court, is also home to two accessible-for-all recreation areas. The Miracle Field has a special rubberized turf surface that enables individuals with mobility issues to play a variety of sports. The bases are also inlaid to allow players in wheelchairs to navigate freely. This field is home to many special education classes for children, adults and nursing home residents, and even plays host to events like the Special Olympics. Next to the Miracle Field is the Kiwanis Miracle Playground, the largest accessible playground in the southeast. For a full list of city parks, visit the Wilmington Parks & Recreation website. Airlie Gardens, one of Wilmington’s most visited attractions, is accessible for visitors in wheelchairs. Most paths on this self-guided tour experience are paved or pervious concrete, and there are resting benches throughout the gardens for elderly visitors and those with physical limitations. Wheelchairs are available for free check out on a first come, first serve basis. Airlie Gardens also offers an Accessibility Tram Service for a maximum of seven passengers. This service is volunteer-based and does not run every day, so make sure to check the Tram Schedule two months in advance. Everyone should be able to enjoy a beach day, and at Kure Beach, everyone can. In order to assist handicapped visitors, Kure Beach offers complimentary beach wheelchairs. These beach wheelchairs are made from PVC pipes and are designed to be pushed manually, making them easy to maneuver in the sand. They can be rented for a week at a time from the Kure Beach Fire Department at . Kure Beach’s Oceanfront Park also includes three wheelchair ramps for easy beach access. Every year, the North Carolina Aquarium at Fort Fisher hosts Deaf Awareness Day, a day when the aquarium offers programs tailored to individuals who are deaf or hearing impaired. These programs include animal encounters, dive shows, feedings, educational programs and more. The aquarium presents this day with the assistance of the Regional Resource Center for the Deaf and Hard of Hearing. The date for this year’s Deaf Awareness Day has not yet been announced but the event is typically held in the early fall. Those interested in attending should visit the aquarium’s website for updates. Wrightsville Beach’s Indo Jax Surf School is committed to empowering disadvantaged, medically fragile and special-needs children by teaching them to surf and exposing them to the ocean. From May through August each year, Indo Jax hosts 10 unique camps that cater to specific special needs. This year’s line-up will include surf camps for children with juvenile diabetes, hearing impairments, cystic fibrosis, visual impairments, autism and more. These camps are free to participants thanks to donations that go directly towards the camps. Surfers Healing is the original surf camp for children with autism, and it returns to Wrightsville Beach each year. By taking children out on tandem surfboards to catch waves, the Surfers Healing team aims to empower participants and provide them with a therapeutic experience from the rhythms of the ocean. This year’s camp will be held on August 21, and registration will be open from April 22-28. Thanks to a $300,000 grant from Trillium Health Resources in 2016, Wrightsville Beach Park is now home to an inclusive playground that features a Liberty Wheelchair Swing. With the new addition, children at Wrightsville Beach can all play together regardless of special needs. Keys to the Liberty Wheelchair Swing are provided free of charge at the New Hanover County Parks & Gardens office (910-798-7620) and the Wrightsville Beach Parks & Recreation office (910-256-7925) during regular business hours. Keys can also be accessed from the playground’s onsite lock box by calling the park offices for the code. Carolina Beach is home to three WaterWheel beach wheelchairs that are free to the public. These special beach wheelchairs are life-changing for those with special needs who still want to feel the ocean or even get on a surf board. Unlike traditional beach wheelchairs that sit high off the ground and are made from PVC pipes, the WaterWheel sits low to the ground like a normal beach chair and is made from stainless steel. The WaterWheel is available for rent from Carolina Beach Parks & Rec for a maximum of five days. Carolina Beach State Park offers several wheelchair-accessible trails so that all guests can enjoy the natural beauty of the park. The gravel Fitness Trail features exercise and activity stations along the route, and the natural surface Flytrap Trail takes visitors on a relaxing three-tenths of a mile loop through the trees. The Life Rolls On event comes to Carolina Beach every year to benefit a great cause: the organization’s mission is to be an epic surf and skate event for wheelchair athletes. Founded by world champion quadriplegic surfer Jesse Billauer, this event inspires infinite possibilities beyond paralysis through adaptive surfing and skating. Life Rolls On is always free for participants, and the organization also provides adaptive surfboards and WaterWheel beach wheelchairs. This year’s Life Rolls On event will take place on August 5.